Widmer Brothers Brewing and Draft Magazine are bringing their Explore Your Craft series to Seattle on Thursday, November 15. It is billed as an unforgettable evening of beer, food, and art. I found one writers review of a past event that that backs this up. Brewing and DRAFT Magazine celebrating the art of craft beer, will be held in Seattle on Thursday, Nov.
Godinez, and artwork from John Osgood. 2012 series will be hosted in Boston on Monday, Dec 3. Godinez; and an urban contemporary art installment by John Osgood. Black IPA—will also be available. WHEN: Thursday, Nov. 15, from 7 p.m. to 10 p.m.
lineup. For more information about Widmer Brothers Brewing, visit www.widmerbrothers.com. Spain is well known for its wine, but what about beer? We recently visited Barcelona to find out. Beer and tapas are a part of Barcelona’s identity; like cafes in Paris, you will find a cerveceria on every corner. Unfortunately, most of them serve standard, limited flavored lagers. We are happy to report that this is beginning to change. There is a revolution brewing in Barcelona, and not just the plight of Catalonia to secede from Spain. Local artesian craft breweries and beer bars are introducing the city to beer with more body, flavor, and hoppy bitterness. With the passion we saw, I’m sure they will succeed in making Barcelona a good beer destination. Our trip wasn’t just about beer so I didn’t attempt to find every good beer spot. 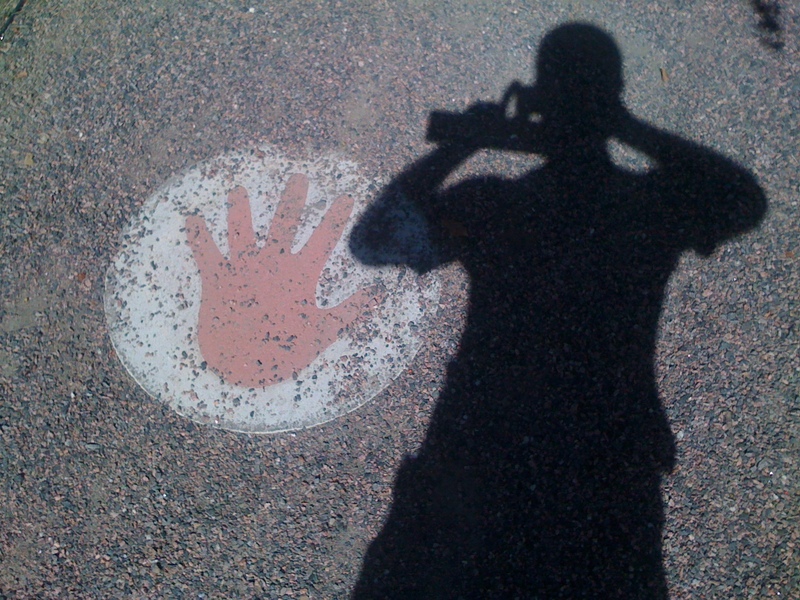 Nevertheless, here is what we found. We started with a visit to Cerveceria Fabrique Moritz, a historic Barcelona beer that was re-introduced in 2004 after closing down in the late 70’s. 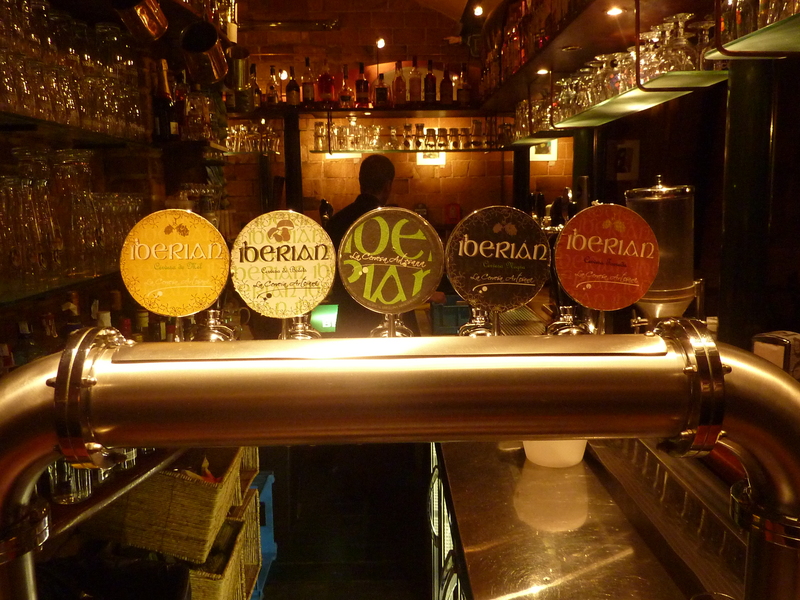 The majority of their beer is produced under license outside of Barcelona; however they rehabilitated their original brewery into an upscale brewpub. They’ve done an amazing job updating the building while keeping remnants of the buildings past; blending the modern lighting, glass, copper kettles, and vintage advertising art, with the original 19th century brick building. On the way to the basement restrooms they’ve even provided a glass floor so you can see the original foundation. The food was great at Moritz, some of the best tapas we had in Barcelona. They had two of their own beers on tap: Moritz and Epidor. 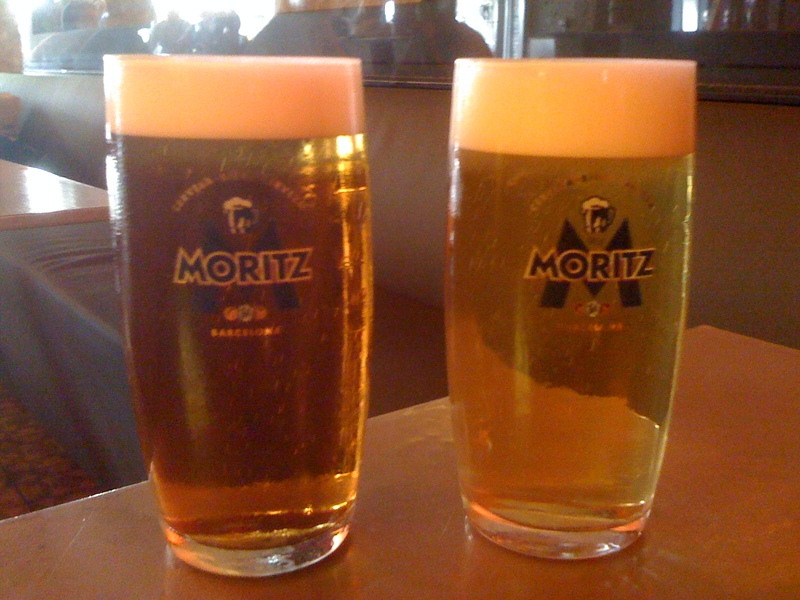 The Moritz was an easy drinking crisp sweet lager with a mineral finish. The Epidor was an amber lager that had a more pronounced hop and mineral finish. Though nothing special, they were both better than the other Spanish lagers we had. I really liked the Moritz “hybrid”, which is a 50/50 mix of the two. 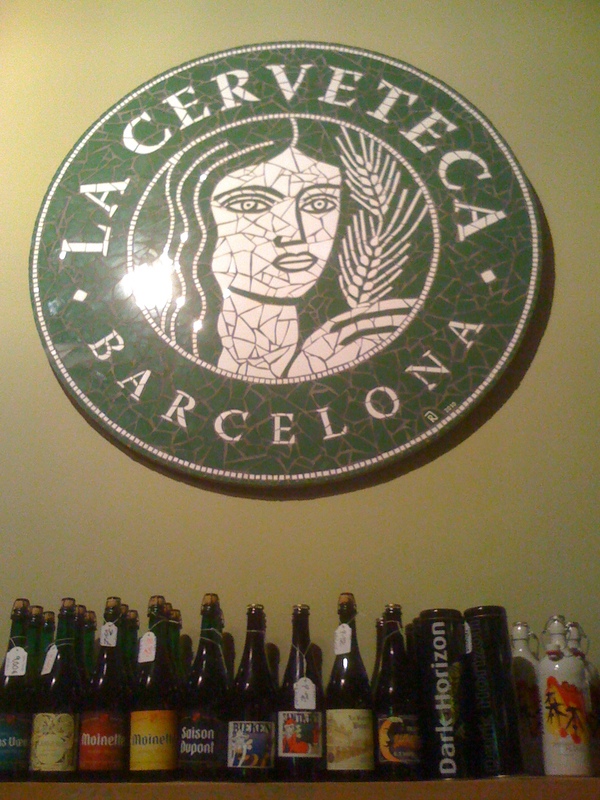 Located in the Grácia neighborhoodIberian La Cervesera Artesana advertises themselves as being Barcelona’s only Microbrewery. 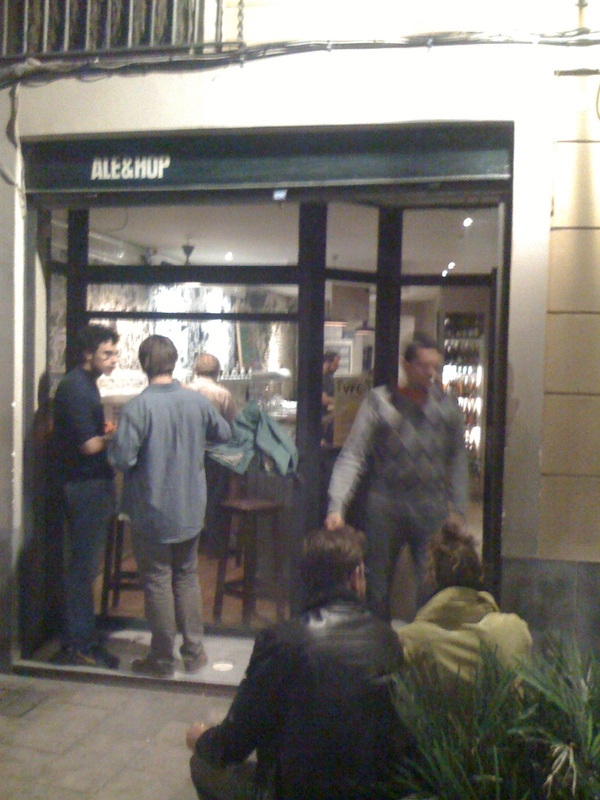 Though they are not the only Microbrewery, they are the only Micro Brewpub in Barcelona. The English style pub is cozy, with brick walls, wood bar, and decked out in traditional burgundy and green. In the rear of the building, behind a wall of windows the brewing equipment is on prominent display. The staff was friendly, and from what we could tell with our limited Spanish were knowledgeable about beer. Besides their own beer, they had a few European beers on tap, and a large bottle selection from around the world. (Including Duff, and Great Divide). They had four of their own beers on tap, all of which were good. The Rossa was refreshing citrusy blonde ale that was perfect after a warm afternoon in Parc Guell. My favorite was the Maca, a medium bodied British Bitter with an earthy malt and floral hop taste. Cindy preferred the Negra, a very dark porter with a big roasted malt and smoky flavor. We both liked the smooth and robust Boletus smoked stout. Like a beacon, the blaring AC/DC drew me in to this Barri Gòtic bar and bottle shop. However, it was the beer that kept me coming back to La Cerveteca. It is one of the best beer bar/bottle shop in Barcelona. They had ten taps from Spain, Italy, Germany and one American beer, and a decent selection of local and international beers in bottles. As a card carrying member of the Rogue Nation, I was happy to see Rogue Mogul on tap and a prominent display of Rogue cases. Though being fairly small, the bar was always packed with people, showing that the beer scene is beginning to take hold. The two standout beers I had here were the local Holz Supporter, a very good porter, and the Italian Brewfist/Beer Here Collaboration Caterpillar, an American Pale Ale that has a 94 overall rating on Rate Beer. As a beer supply store and manufacturer of brewing equipment Ca L’Arenysis helping arm the craft beer revolution in Barcelona. 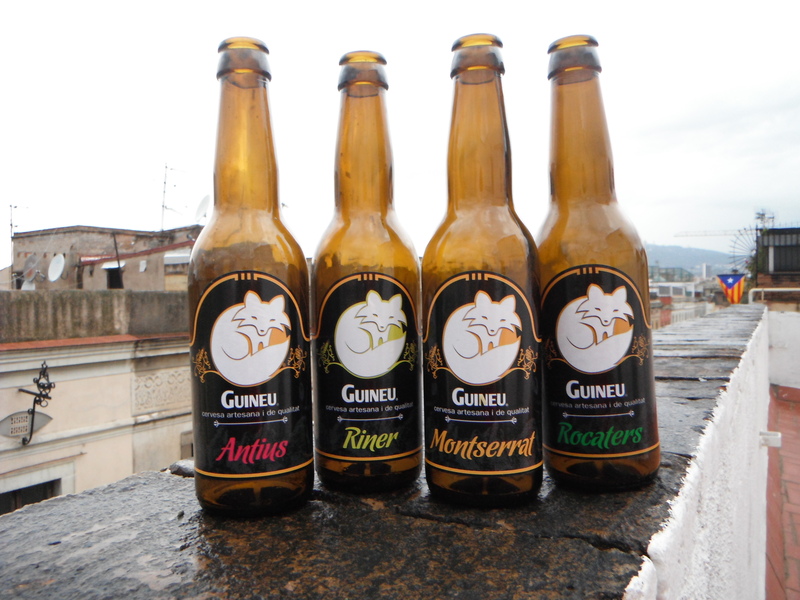 Under the name Guineu, they are also producing some fine beer. We purchased a few bottles form La Cerveteca and took them back to our apartment. Pours cloudy dark amber, little head and has a bready caramel nose. The flavor was sweet caramel up front and finished fairly bitter. It reminds me of a good homebrew. We both liked it. I wouldn’t say it up there with the beers we are used to, but it holds its own, and has way more flavor than most of the beer in Barcelona. In the glass it was dark brown with a thin tan head and a sweet chocolate aroma. It tasted like it smells, and has a bit more bitter hop present than most stouts. The mouth feel was a little thin, but the carbonation is just right. It’s a great dessert beer and goes real well with the dark chocolate we bought. It was a semi-opaque copper, with a thick white head, and a fruity aroma. The taste started with candy and finished with dry citrus hop bitterness. Okay, but not something I’d go back to. A cloudy golden ale, with a slight pinkish tint, a thin white head, and a bready/floral aroma. Bready, grassy malt taste followed by citrusy and floral hop bitterness. For a super session beer, 2.5%ABV, this beer has a lot of flavor and more body than expected. I could drink a lot of these. Thinking they were in Barcelona, I reached out to visit their brewery. Xavier responded quickly and agreed to a tour. After discovering they were a couple of hours away I decided that we weren’t up the trip. Not wanting to let us down, Xavier came up with a great alternative. He hooked us up with his friends at Cervezas Fort in Barcelona and helped arrange an appointment. After a 20 minute Metro ride we arrived in the l’Hospitalet neighborhood, a residential and light industrial area that probably doesn’t see a lot of tourists. A brief walk from the station, we arrived at the door of Cervezas Fort. We found our way in, went to the second floor, and met up with brewer Federico Gorgone. We were happy to find that Federico spoke English. He showed us the small, 600 liter (5 barrel) brewery that contained everything to brew beer as well as storage, office space, and bottling. He took us out on the back roof top and showed us where they hoped to soon expand. Oh yeah, and he told us that the brewery had only been operating for a month. Gabriel and Federico spent over an hour with us; taking time to tell us about the craft beer movement in Barcelona while they chilled a couple of beers for us to try. Federico said that they are trying to put the home brew culture into their brewery, doing everything from the heart, and putting soul into the beer. Their goal is to break into the “Lager Crowd” and educate them to good beer with bitter hops. They plan to add a tap at the El Vaso de Oro to help. Since Spain grows very little hops, the people are just not used to the flavors that they provide. The good news we heard was that Barcelona’s first craft beer festival this year was very popular. 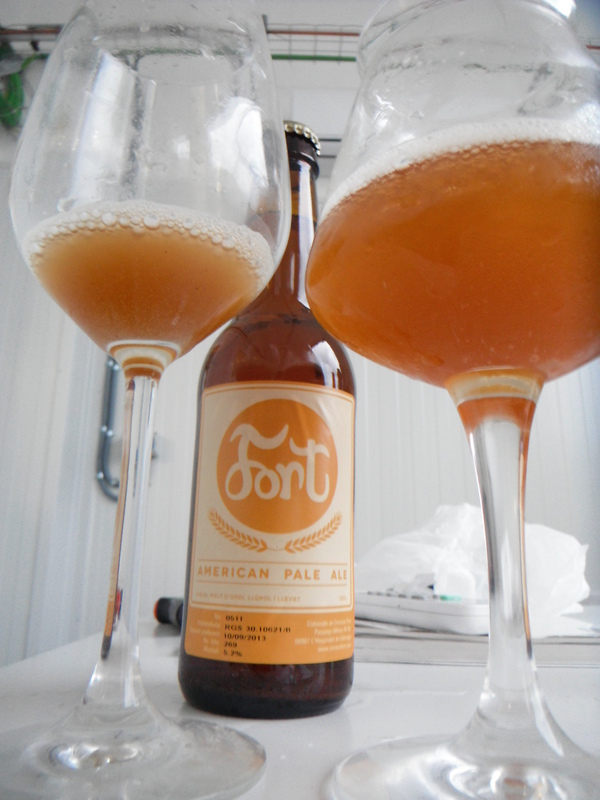 They opened a couple of bottles of their American Pale Ale for us. It was good; fairly grassy upfront with a nice floral finish, unfiltered so there was a little residual yeast flavor. Being so new, they say they are still tweaking their recipes. Gabriel led us back to the fermentation tanks, and took a sample of a single hopped version of the pale ale. Darn, it was real good! 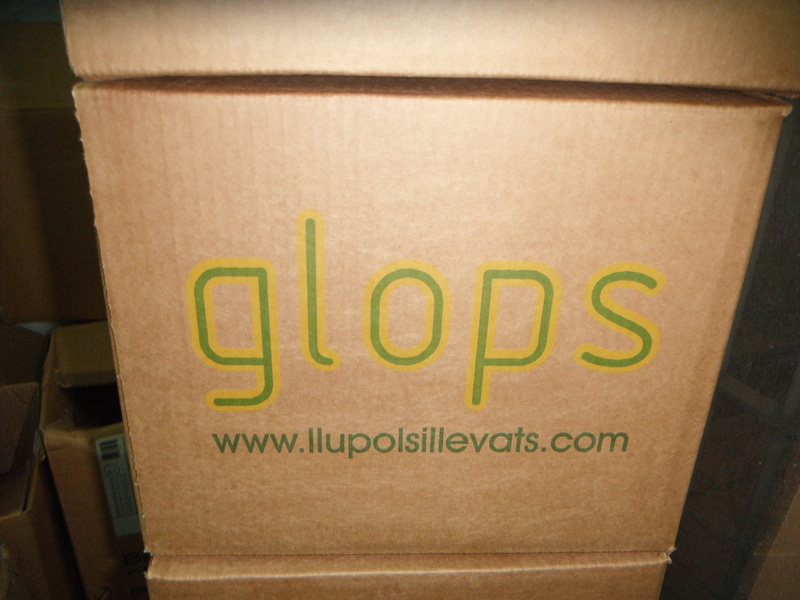 Talk about two birds with one stone, across the hall from Fort sits Llúpios I Llevatsthe brewers of the Glops brand of Cervesa natural artesana. Cerveser (Brewer) Àlex Padró was introduced to us as the founder of craft beer in Barcelona. He started with a 150 liter brewery 5 years ago, and has since doubled his capacity to 300 liters. Though he was busy, he showed us around his micro-brewery allowing us to peek inside one of the fermenters, and watch his bottler work. He kindly gave us some coasters and buttons, and we were on our way. It was our last night in Barcelona, and we had time for one more beer. We set out to find Ale & Hop in Barri Gòtic that Federico had recommended. We had a rough idea of where it was, but the small alley like streets can get a little confusing. On this night, my beer positioning system (BPS) was in fine working order, and we made it directly there. It’s a quaint bar with a few bar stools and back area with a several tables. They had ten or so beers on tap and a good bottle list. It had a friendly vibe, tasty food, and good beer, making it a must stop for any beer traveler. If I had another night in Barcelona, I would have gone back. I look forward to one day returning to Barcelona and seeing what becomes of their bubbling beer scene. 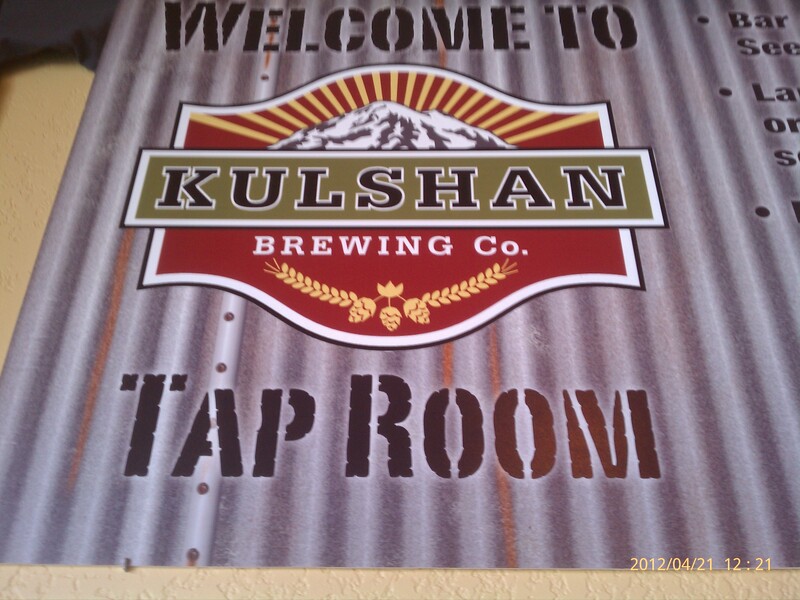 After a nice 20 mile ride my thirst was in full swing and the weather was amazing, so I headed up to Bellingham’s new Kulshan Brewing Company. Unlike many breweries in Washington, this is located right in town and near residential areas making it an easy walk for most. The brewery has a nice cozy feel with several tables and a six seat bar. I cozied up to the bar and ordered the sampler tray. The samples came in small jam jars. While being kitschy, the wide mouth jars provide a good nose for the tasting experience. The beers were excellent, the brown porter was amazing, the Russian imperial stout was warm and silky, and the CDA …I still taste it. Dark, malty, hoppy, the best CDA I have had yet. The locals told me that their IPA was amazing, but due to overwhelming demand, it was out for another week. Outside was a Hawaiian BBQ truck, BBQ with a Hawaiian twist. I ordered the grilled Hawaiian chicken. It was very tasty. They currently have two trucks that rotate, check out their website to see what the current offering is. Next stop was Elizabeth Station. Elizabeth is a new bottle shopped that opened up in early April. Entering was a very cozy feel, with dimmed lighting and warm wood tones throughout. The offered a very nice beer selection organized by brewery and a good spread of beers from the Northwest and abroad. They also have a very nice wine selection (could not tell you more about the wine, I am just not a fan). I ordered a Cascade Saison de Maison at the long wood standup bar. As I was quenching the amazing Saison, I chatted with locals and noticed they offered small food offerings (sammies and snacks) and French press coffee. This is by far, the best bottle shop I have been to. Some may offer more beers, but this had the best vibe. Before leaving I bought a Pelican Doryman Dark Ale and IPA, a Dales Deviant IPA, and an Anchor Liberty. Since the weather was absolutely wonderful, I had to make a quick stop at Skookum Brewing in Arlington. They are only open from 2-5 and it so happened to fit in my window. Skookum is really like no other. The cross section of people was amazing; car enthusiasts, bikers, beer geeks, and locals. Oh, lots of animals too: horses, horse drawn carts, dogs, and ponies. I ordered a brown and hairy. B/H is a nice low alcohol nut brown ale that is very quaffable. If you have not had a chance to visit and the weather is nice, get there soon! The snow and ice may be gone, but that doesn’t mean you have to stop enjoying great winter beers. One way to continue is to attend the Base Camp Winter Ale Fest on March 3rd. This second annual event benefits Summit Academy, an independent school that uses a field based approach for intensive study in the environment arts sciences and community. Last year more than 300 people attended and enjoyed great beers from Skookum, Anacortes Brewery, Chuckanut, Boundary Bay, North Sound to a name a few. 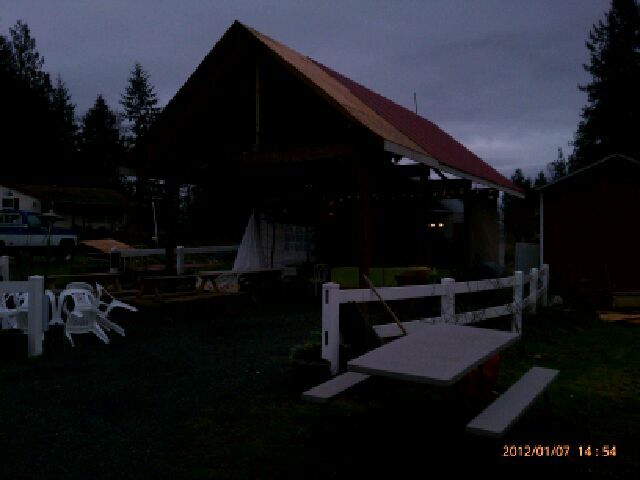 This year they move to the Skagit County Fairgrounds and look to have another impressive Washington Brewery lineup. There will also be live music, local brats, and oysters on the half shell. Not sure if we’ll be going, but it sure sounds enticing. FTC INFO: This is not a paid advertisement. I did a little trip over to Kitsap to visit a few breweries. First stop was in Bremerton to visit Der Blokken Brewing. Der Blokken is a brewpub tucked away in a sleepy neighborhood. I am always fond of breweries that can find a spot in a neighborhood as I believe they add value and charm. The pub has a real cozy feeling with dark wood floors, a small 8 seat bar, and several tables. In the middle of the dining area there are two 7BBL fermenters. I bellied up to the bar and ordered a sampler tray and a Kip and Fritz (a chicken strip with fries cheese and stout gravy). As I started on sampler one, texting notes, and snapping pictures a fellow sat down next to me and asked me about the beers. He introduced himself as the brewer and proceeded to check my beers. I was the first patron of the day and he stated his beer lines were long and wanted to make sure I got good samples. He ended up re-pouring most of them to ensure I had a fresh sample. I asked a barrage of geeky beer questions about his brewery and he obliged with very candid and informative answers. 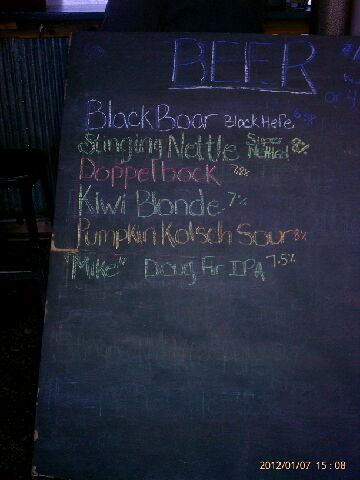 The beers were all very good but his black and double black Ales stood out. I am not sure they fit in a category of stout or porter, but I have never cared about that anyway. My food was very good and I could have ordered a glass of the stout gravy. A mile away was the new Silver City Brewing production brewery that opened in late 2010. They are currently in the process of building a tasting room; for now they are only selling swag and 22 oz bottles. I told the gal that I was from Snohomish and she gave me a nice tour of the facility. Multiple 4BBL fermenters and a massive 80BBL fermenter dominate the warehouse. The brewery is also is working on barrel aging beers and have several barrels aging some tasty goodness. The new tap room should be ready in the Spring of 2012. A short drive up to Poulsbo took me to Sound Brewery, a small warehouse facility with a quaint little tasting room. It housed a small bar and about 4-5 tables with a LCD screen playing the football game. Sound brewing is focused on making beers as authentic as possible, sourcing ingredients to make them true to style. European Hops, sugars from Belgium, Marris Otter grain are some of the examples. I ordered a sampler tray and I was truly amazed. Never been one to jump on the Belgian bandwagon, but I will be keeping an eye out for their 22oz bottles and taps. Of course not all their beers are Belgian style as their IPA is wonderful. Just a short 5 minute drive away was Slippery Pig Brewing. Follow the signs down a long gravel road and find a parking spot. Take a peek at the Pigs and dodge the chickens to the outdoor shelter of Slippery Pig. The beers here are not mainstream (the website promotes a 200IBU rhubarb IPA). It is a homebrewer gone mad and living the dream. The shelter has 4 or so picnic tables and several outdoor heaters to take off the chill. I ordered a small sample tray. 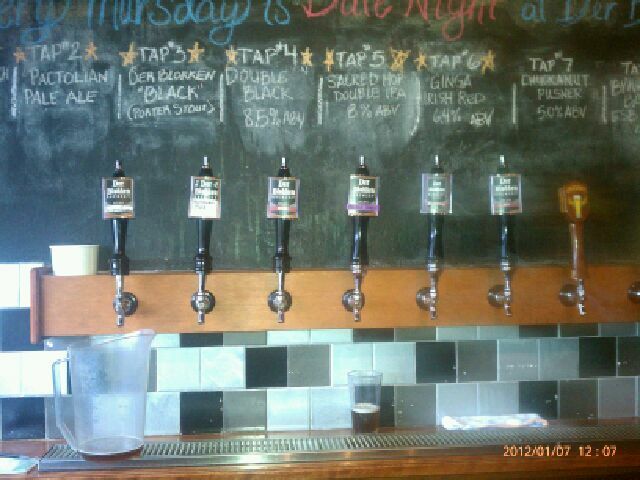 Standouts were a Cascadian Dark ale (nothing shocking here) and a Doug Fir IPA. Yes, Douglas Fir, and I liked it. Brewers like the taste of a Simcoe Hopped IPA because of the hints of Pine, so why fake it? Why not add the resins of a Doug Fir? I say it worked, and I would order it again. If you followed Good Beer Trips on Facebook and Twitter in 2011 you probably noticed all the #beer #number posts. What was that about? It was obvious was that I was counting beer, but what counted as one and what was my goal? One beer equaled any beer I drank between ten and twenty-two ounces. This included any beer from a schooner to a bomber, but excluded any samples or tasters. Another rule I had was that there were only four beers in a growler. Until December I really didn’t have a goal. I never planned on doing the count in the first place. It started as a simple New Year post of the first beer I drank, and then took on life of its own. When I realized I was going to end up in the 700’s for the year; being a good Washington State native I knew I had to land on a 7×7 number. It would be too easy to get to 747; I didn’t think I could deliver on 787; 757 and 767 weren’t too exciting; so thanks to Kendall’s (Washington Beer Blog) recommendation I settled on 777. The idea was to end on Scuttlebutt Brewing’s 777, but when I was unable obtain a bottle, I decided to end where I started, but a year later. Beer #1 was Firestone Walker XIV Anniversary Ale and beer #777 was Firestone Walker XV Anniversary Ale. Over the year I was encouraged by friends to keep up with the count. Early on and throughout the year, it was Chris (@SocialRetard) who convinced me to keep going. Up in Canada, Bob was helping my keeping track of my beer per night average. At work, it was Ron (@shaqfeasel) who helped me select milestone beers. Most of all it was my wonderful wife, Cindy (LuschC or @torkwench), who was very patient as I rudely posted as she sat waiting. I know it was annoying. In May, it finally dawned on me that I should create a spreadsheet to actually keep track of the beer. Up until then, I had only been posting them to Facebook/Twitter. I don’t know what took me so long, I love spreadsheets. It was a pain, but I went back through and documented each. I found a few errors, and true upped the count. I then went a few months before updating it a second time. You would have thought I would have learned, and had to true up again. The second time, I went back and added additional information like the State/Country it was from and the style of beer. After this I rarely went more than a week without updating the list, and became intrigued by the information I was gathering. Comments: Over 94% Craft Beer, need I say more? Comments: I drank American! Over 92% of the beer I drank was made in the USA. A trip to Whistler and the availability of Howe Sound in Seattle boosted Canada. Eating at Mexican restaurants help explain Mexico. Beer is not one of China’s better imports. Comments: I kept it local and drank a heck of a lot of beer from Washington. Throw in Oregon’s fine beer and 66% of the beer I drank came from Cascadia! Even with a trip to Hawaii and Colorado, they still couldn’t beat out California. Comments: Am I a hop head? I drank a lot of IPA’s, but just think how many Winter Warmers I could have had if they were available year round. For the most part, I’m a fairly well rounded beer drinker. Comments: My local brewpub Elliott Bay Brewing Company with their two locations (soon to be three) just edged out the mighty Full Sail, who very narrowly edged the Seattle staple Georgetown. Two of the top five are within walking distance (Elliott Bay West Seattle and Big Al’s). My idea of cost cutting is Trader Joe’s Josephsbrau line. Beer from 152 breweries, that is not too shabby. Comments: Wow, 430 different beers, pretty crazy. My go to beer, Session Black, rocketed to a clear victory in the race for the top beer drank. I just like its dark malty flavor in a lighter bodied form factor. Georgetown’s Bob’s Brown Ale may only be around for a few weeks a year, but I got as much as I could. How the heck did Shlafly Pale Ale sneak in there? I was held captive for a week in St Louis and this was the best beer that was available, not that I minded. Three winter beers in the top eleven, what can I say, I like the winter beers. Black Toad is really pretty good, try it, you might like it too. After nearly two months, here is part two (of three) of our GABF trip to Colorado. Enjoy! It would have been more difficult to leave Fort Collins if I hadn’t known what was coming, two nights in Boulder followed by three nights in Denver for the GABF. The appetizer for all this was a transfer day stop in Longmont for lunch at the Pumphouse and then a sampler set at Left Hand Brewing. 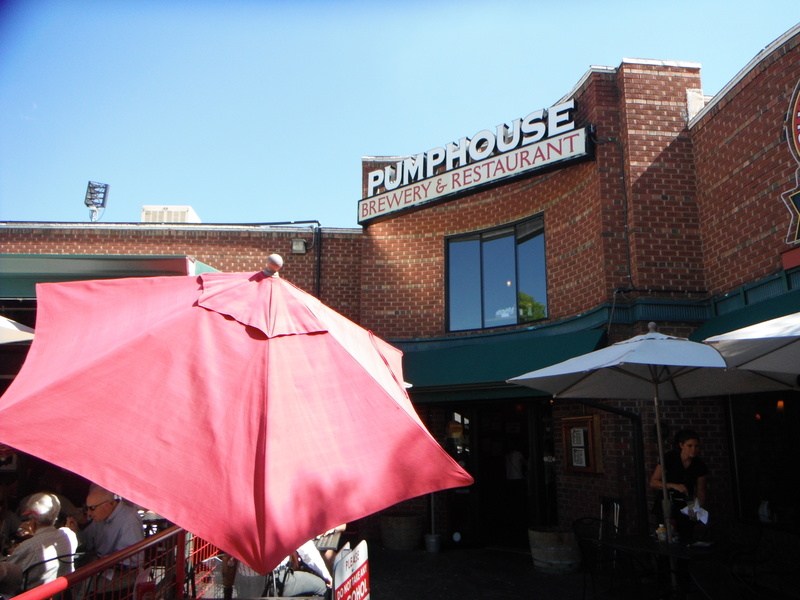 Located in the heart of downtown in a historical building the Pumphouse has been serving up food, fun and beer since it opened in 1996. The outdoor patio was packed for a weekday lunch rush, so we ventured into the pub. You would think you were sitting in a former fire station; however it is just a theme that has been done really well. The brewery is impossible to miss sitting behind the bar with the 10 barrel fermentation tanks hovering above. We didn’t mess around and ordered our lunch and a couple of draughts. It was Tuesday and “Guy’s Day”, so my pint of Hot Shots Harvest Ale was only $2.50. LushC was bummed and had to pay full price for her 4-Alarm Copper. The 4-Alarm Copper is their take on a German Altbier, and as advertised had a bready malt and a mild floral hoppy finish. Hot Shots is their seasonal fresh hopped amber that finishes with a big wet floral hop finish. Both beers were very quaffable and the salads were fresh and agreeable. We checked out a few of the shops in town, and then began our next trek. After a navigation gaff that took us under and overpass and across railroad tracks we made it to a trail that took us right to Left Hand Brewing. Of all the breweries we visited on this trip I was most excited to go to this one, and I was not disappointed. The operation was much larger than I expected, and although we didn’t take a tour they have one online that is very entertaining. If I had my guess, they are located in a former lumber mill, and the tasting room showed it with a bountiful of exposed wood that made it feel very cozy. The crowd was sparse when we arrived, but not long after it really picked up with locals, out of town brewers, and beer geeks like us filling the bar stools and tables. It was GABF week after all, and as I heard one bartender say this was the busiest week of their year. Surprise, surprise we started off with a sampler tray of eight beers of our choice. We selected Polestar Pilsner, Sawtooth American ESB, Good JuJu Ginger Pale, Stanger American Pale Ale, 400lb Monkey, English Style IPA, Milk Stout (Nitro), Fade to Black v.3 Pepper Porter, and Wake Up Dead Stout (Nitro). It’s impossible to say anything bad about our selections, as each was a good as expected. I did most of the sampling since LushC was driving. It was no shock that the Milk Stout was our favorite; so smooth with robust flavors of roasted malt, chocolate, coffee, and a wee bit of cream. Good Juju was very interesting; light, crisp, and refreshing with a spicy ginger kick. Earlier in the year I was very fond of Fade to Black v.2 Smoked Baltic Porter and v.3 Pepper Porter was equally as impressive replacing the smokiness with a touch of chili pepper reminding me of Mexican Chocolate. LushC finished with a glass of the Peotch, a collaboration beer with Terrapin Brewing in Athens, Georgia. Did it ever have a big peach smell and taste, though it remained crisp, and dry, and not too sweet. Needing a little pick me up, I went with the Beer Week Sauce Coffee Porter. Wow, what a great coffee aroma, robust coffee taste, and smooth to the last drop. Upon leaving we split a Grilled Cheese Sandwich from the Salt Box Food Truck outside before venturing on to Boulder. We splurged a bit and stayed at the historic Hotel Boulderado, a quaint hotel that was very comfortable, clean, and friendly. It was perfectly located in the heart of downtown too. That evening we took a break from beer and went to Tahona Tequila Bistro for south of the border inspired cuisine and some fermented, distilled, and aged agave nectar. In the morning we prepared for our day with a brisk warm up walk on the Boulder Canyon Trail. We made it a few miles before we started to get thirsty, and turned around, making a brief stop at the hotel before blasting off on our Boulder Urban Beer Hike. 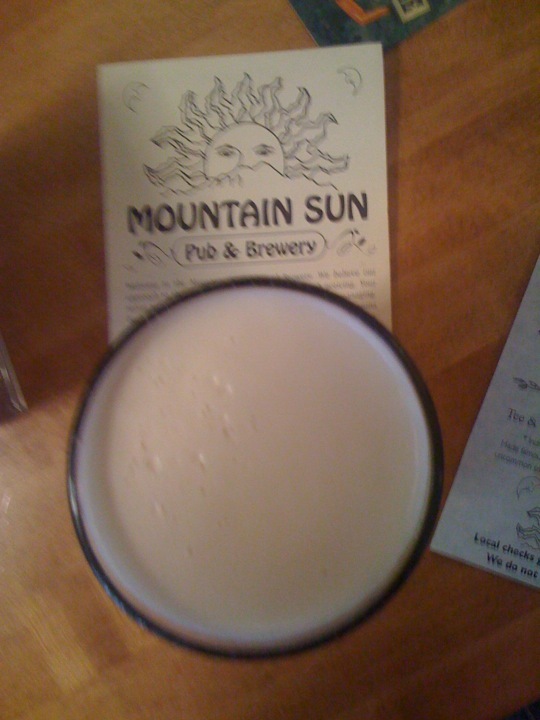 The first stop on our excursion was Mountain Sun Pub and Brewery, the only independent brewpub in downtown Boulder. For those from the Northwest, Mountain Sun kind of reminds me of a McMenamins with lots of quirky art. They have a real community feel, and a fresh local menu. Planning to return later (though we didn’t ) we just stopped for a quick bite and a pint. My BLT was as expected, and heck if I remember what LushC had. I do know that to quench our thirst LushC went with a Colorado Kind Ale (nitro) and I went with an Illusion Dweller IPA (nitro). The Kind Ale was a bit sweeter, the IPA was a bit hoppier, but they were both smooth and well balanced. 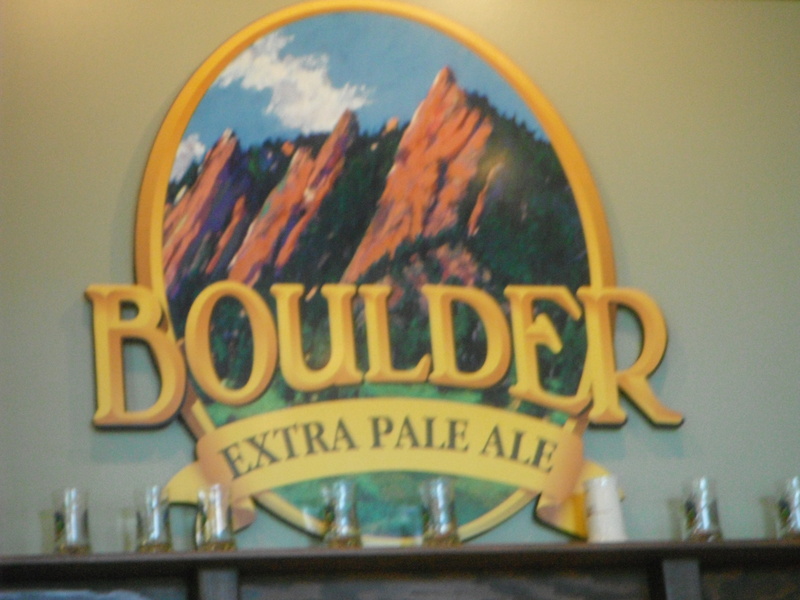 The next stop on our UBH was Boulder Beer, roughly two miles away. I hadn’t done my research and was surprised they had a pub and not just a taproom. We could have eaten here, but I was content with the choice to eat at Mountain Sun. The pub is broken up in to three sections: a dining area with large glass windows looking into the beautiful copper top mash tun and brew kettle, the bar side with window views of the fermentation tanks and bottling line, and a large outdoor beer garden. The place was packed so we grabbed the first table we saw on the bar side. When our server got to us we asked for a couple of waters and a sampler tray. Not long after we were presented with the mother of all taster trays. It was a good thing we were walking, because we would be sampling fourteen of their beers: Fresh Tracks Fresh Hop Copper, Killer Penguin Barley Wine (Barrel aged), Saison (Noir aged), Kolsch, Mojo IPA (Nitro), Mojo IPA, Fresh Tracks (Cask), Buffalo Gold, Single Track Copper, Sweaty Betty Blonde, Hazed and Confused, Hoopla Pale, Flashback India Brown Ale, & Planet Porter. With that many samples it’s tough to really judge them all. That said I really enjoyed the subtle tartness, hints of cherry, and flowery hops in the Saison and the easy drinking sessionable Single Track. For favorites LushC’s choose the well balanced, mild hopped Fresh Tracks whereas I went with the light bodied Flashback India Brown Ale that had a nice toasted toffee flavor and an exploding hop finish. We survived Boulder Beer and continued on our way. It just so happened that our way took us right by Redstone Meadery. LushC likes mead, plus I like mead, plus they had a tasting room, seemed like an easy equation. It was a pleasant stop. We tried many samples, took a peak at the Meadery (it was smaller than I thought), bought some mead filled chocolates and were soon back on the beer trail. Okay, we planned on visiting the Roundhouse Distillery next, but they were closed, which was probably good for us. Our final stop of the evening was at Avery Brewing. Wow, have they grown since we were there in 2007. The tasting room has doubled in size, and is no longer just a few tables in a warehouse front office. Sure, it is still located in an industrial warehouse district, but it now has a Bavarian Tavern feel. Outside they have a nice patio area, where we enjoyed the warm Colorado evening. We shared our table with recent college grad from California who was on a multi-state/country motorcycle camping trip. It was fun hearing stories of his trip, if I could only remember some of them. Being resourceful, Avery has teamed up with the caterer across the parking lot, Savory Cuisines, to provide delicious eats to go with their amazing beer. We were a bit peckish, so we ordered the Sweet Potato Tots smothered with Pork Green Chili and Cheese. It was oh so good! With over twenty beers to choose from, it was pretty difficult deciding what to order. 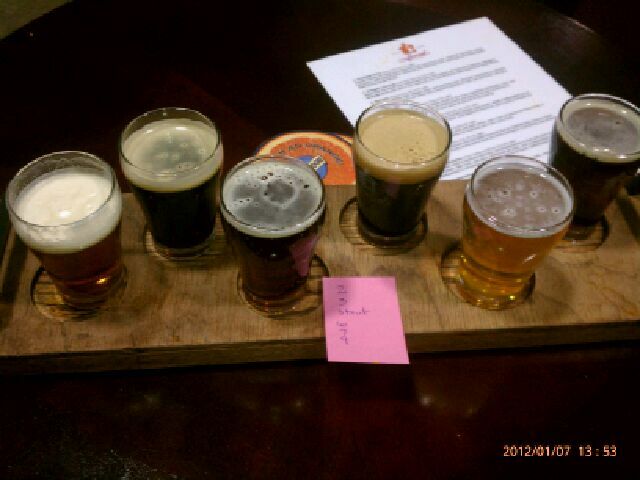 We were past the point of wanting a sampler, so we went with beers you’d likely only see at the brewery. LushC selected the Eremita Strong Sour Ale aged in Cabernet and Zinfandel barrels. I threw caution at the wind and started with the Bad Karma Belgian-Style pale ale aged in Cabernet barrels. 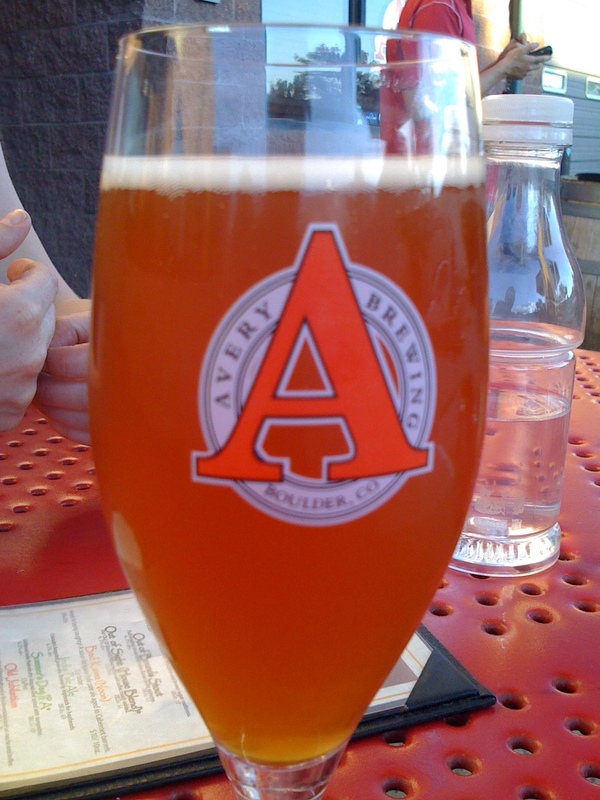 I followed it up with the Freckles Saison, brewed with rosehips, cherries and orange peel. All three were very good. As with all beer hikes this one had to come to an end at some point, and that time was here. We settled up the tab, and hit the Boulder trail. After a seven mile beer hike, and a decent amount of beer and mead, we slept well. FTC Info – Nothing was received for the writing of this post. Nothing. That is why it took over two months to get posted.